How can you print something larger than the printer itself? 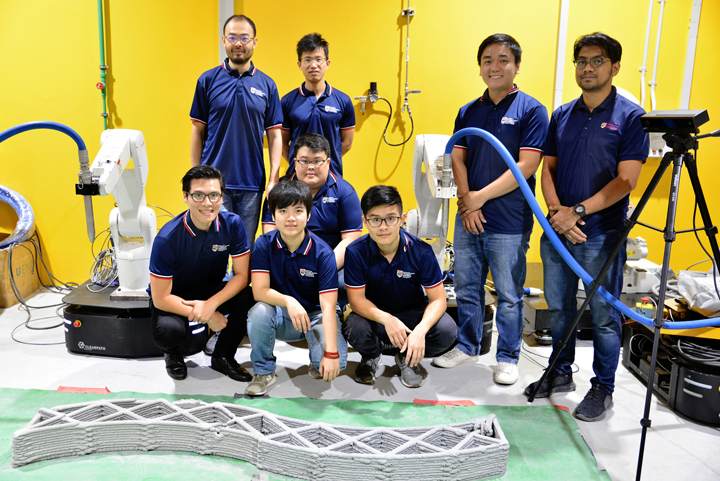 That’s the problem researchers Xu Zhang, Mingyang Li, Quang-Cuong Pham, and others set out to solve at the Singapore Centre for 3D Printing at Nanyang Technological University (NTU). Their solution: mounting the 3D printers on a pair of Ridgeback mobile robots, who work together to print different sections of the same part. 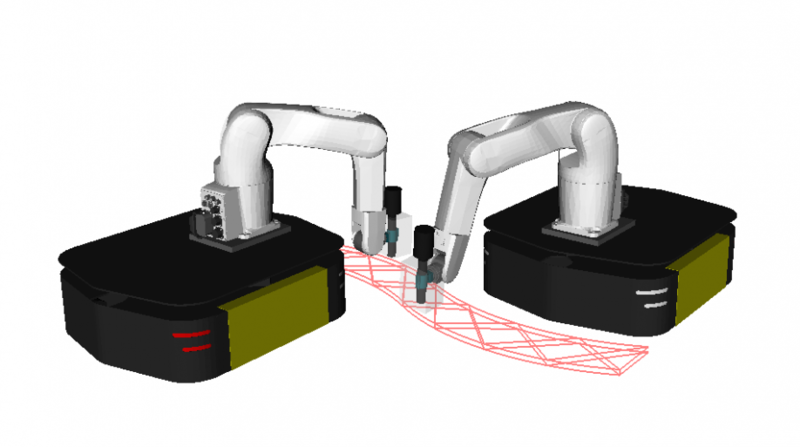 Impressively, the robots work at the same time and in overlapping workspaces. In fact, the paper, published in August 2018, marks the first time a large concrete structure has ever been 3D-printed by multiple robots concurrently! Gantry-based systems—in which a cartesian robot moves inside a cage—are large and inefficient. To print a meter-long structure, for instance, you’d need a cage of at least 1 meter cubed. This massive external framework means you can’t build anything bigger than your system. Robot-arm-based printers are somewhat more efficient than gantries, but they still take a long time to print anything, because a single print nozzle still hogs the entire print space. Multi-robot systems like Minibuilders are not ideal for printing concrete structures, because the first layer of concrete needs to harden before the climbing robots can proceed to print the next section. As you can see, mounting 3D print nozzles on robot arms is nothing new. What’s different here is that the researchers mounted the arm itself on a mobile base—allowing the print nozzle to move around in a bigger workspace—and they figured out how to get two robots to build a structure at the same time. The result is a scalable system: one that lets the user introduce as many robots as needed to complete a printing task quickly and efficiently. The team started with a 3D simulation of the Ridgeback-based robots, planning the “nozzle path” of the structure they wanted to print. The team started with 3D models of each hardware component (provided by the manufacturers). Working within a CAD program, they planned the “nozzle path” for the structure they wanted to print. This was essentially just slicing the desired structure into layers, each of which represented a path that the robot arm would follow. Next, they allocated the robots to particular sections of the structure. In this case, each robot was responsible for printing half of the structure. Finally, they set the robots loose to print the structure (see video below). You might notice a guy holding a teach pendant in the background. He’s not controlling the robots—once the robots have been programmed, the building process is entirely autonomous. He’s just there to hit “stop” in case the robots go haywire and start spraying cement at the walls (which fortunately hasn’t happened yet). The team used two Clearpath Ridgeback mobile robots in their experiments. These indoor robot platforms served as the base upon which the robotic arm, controller, sensors, pump system, and print nozzle were mounted. The high payload capacity wasn’t the only benefit. The team also liked how the Ridgeback has holonomic drive, with four independently driven, omni-directional wheels. Conventional robots-on-wheels are non-holonomic: they can only move backwards and forwards, not side-to-side. The Ridgeback, by contrast, can move in all directions. This makes it much easier to maneuver in precise paths. After publishing this paper, the team wanted to take their mobile printing system to the next level—by building one that could print while moving. They wasted no time, finding a solution within just a few months! So far in this blog post, we’ve been discussing a system where the platform remains motionless while the robot arm prints the object. But in the team’s latest method (detailed in this paper), the platform and printing arm move simultaneously. Why is this such a big deal? Because it overcomes a huge hurdle to printing bigger structures. With the old stationary system, the robot could only print within the area its arm could reach. To build bigger structures, you had to put multiple robots to work alongside each other. With the new system, though, this size limit no longer applies. Since the robot can move around, you can build much bigger structures with just one robot. Of course, there’s still a lot of work to do. The team wants to integrate more sensors, explore better part-joining strategies, and develop a motion-planning solution for multiple printing-while-moving robots. And they won’t stop there. In alignment with NASA’s 3D-Printed Habitat Challenge, their ultimate goal is to create robots that can build autonomously in extreme environments—from the most remote caves on Earth to the moon, Mars, and beyond.